(Host) As the world remembers the late Alexander Solzhenitsyn, the writer and dissident, the residents of one Vermont town are remembering a neighbor. His 18 years in Cavendish was the longest Solzhenitsyn lived in any one place. And townspeople still have vivid memories of his impact on their community. (Zind) Solzhenitsyn arrived here in 1977 at the height of his fame: A Nobel Laureate and a celebrated dissident who’d been banished from his homeland. (Zind) To keep strangers out, Solzhenitsyn put up a fence on the nearly 80 acres of land he owned. It struck a few people as un-neighborly and it didn’t sit well with some hunters and snowmobilers. So the writer appeared at the annual Cavendish town meeting and asked people to forgive him for any disturbance his presence had caused. Phyllis Bont’s husband, Gene, says Solzhenitsyn’s words broke any ice that remained between him and the people in town. (Bont) "When he came to the town meeting and explained, that just seemed to wipe out any sort of hesitancy about his being here." (Zind) Townspeople protected Solzhenitsyn’s privacy. The sign at the general store warned that there would be no service for shirtless or shoeless customers, and no directions to the Solzhenitsyns’. The author’s family was a familiar sight and his children attended the local public schools. 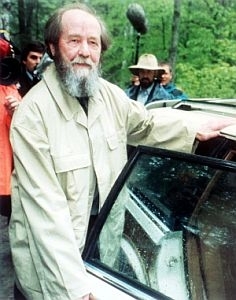 Solzhenitsyn left Cavendish to return to Russia in 1994. But Margo Caulfield says she still thinks about him whenever she drives by the house where he lived. (Caulfield) "Because I do know where he lives, I often think of him as an individual who has made a tremendous impact, and this whole concept of not just being a survivor but being a thriver, which is what he was." (Zind) In the years after he settled in Cavendish the fence around Solzhenitsyn’s property gave in to weather and wear, and he never had it replaced. On the eve of his departure, he appeared once more at the annual town meeting. (Solzhenitsyn) Solzhenitsyn speaks in Russian. (Zind) Speaking again through an interpreter, Solzhenitsyn thanked residents for their understanding and for protecting his privacy.